This site is dedicated to the research I conducted at the Center for Excellence in Education in McLean, Virginia. 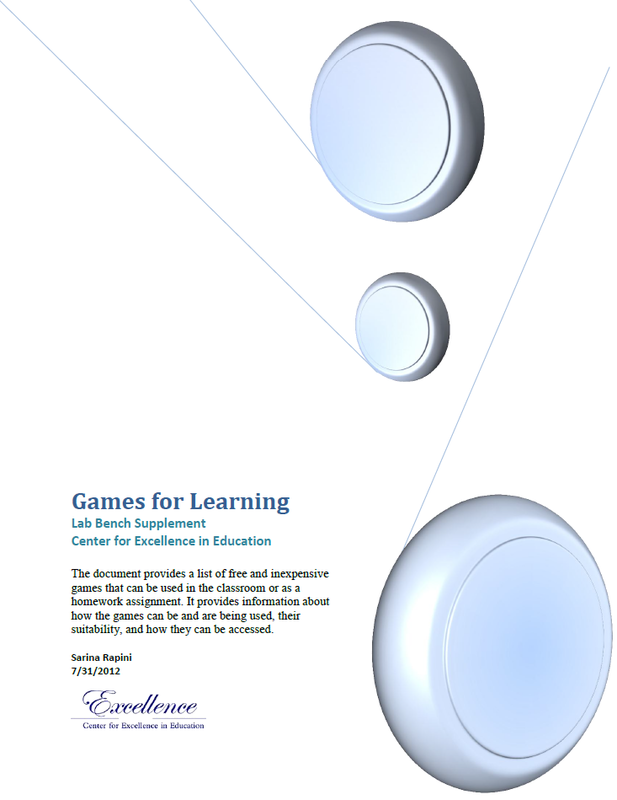 I spent 12 weeks rigorously studying and researching digital game-based learning (and continue to). I walked out with my paper: "Beyond Textbooks and Lectures: Digital Game-Based Learning in STEM Subject." Instead of simply submitting my paper to Congress and ending my journey there, I wanted to share what I have learned. You can download a copy of my paper below. About "Beyond Textbooks and Lectures"
I specifically looked at games for STEM (science, technology, engineering, and math) education, but during my research I also found how games can facilitate learning in social studies, language, art and history. Games can be invaluable learning tools that facilitate problem-solving, scientific inquiry, technology literacy, and creativity. While I am still cautious about games in the classroom, I strongly believe they could be very useful in after-school and informal learning environments. I hope my research and resources will help you make an informed decision about game-based education and maybe aid you in your own studies. Below: Download "Beyond Textbooks and Lectures"
Below: Download my "Game Resource Guide for Teachers"